Before moving on, a few assumptions have to be put down along with a few myths about boot camp and the experience. Movies about the military shape our knowledge and understanding of military life far more than do the testimony of most veterans. This is why so many of the assumptions surrounding the way we live are so drastically wrong. Don’t get me wrong, Full Metal Jacket is a classic, but there is much that needs to be corrected, if not for being entirely inaccurate, than for being dated. Because of movie legends, many ideas have permeated that leave regular people not really aware of what to expect. Beyond that, a lot of veterans don’t help very much either. Vets have one thing in common – over time, our stories get better. For many who served during times of peace, boot camp is pretty much all they had to talk about. Their exaggerations (we’re guilty of it somewhere) left a few more false legends that need to be corrected in those who want to know the truth. Then, of course, there are those people who simply lie about their military service altogether, and oh the stories they can tell. If for nothing else than the horde of pretenders, I’d like to list a few of the more common misconceptions that have been asked to me before and attempt to set the record straight there first before moving one. Is boot camp hard because recruits need the skills they learn to fight and survive in war? 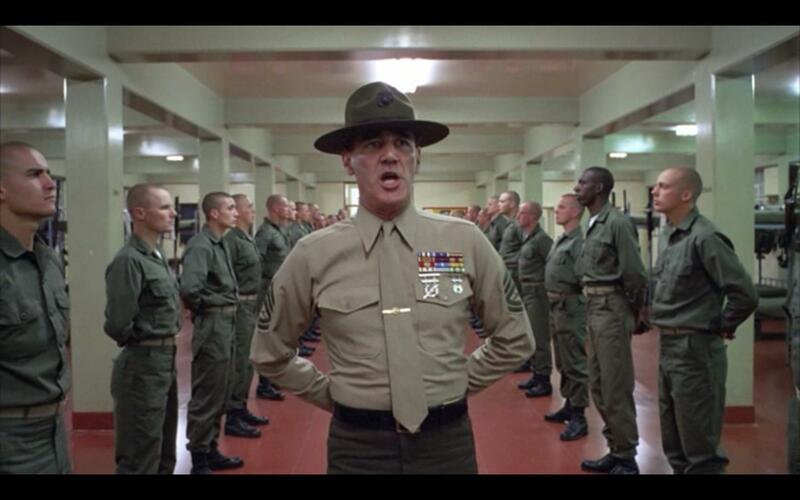 I’ll be blunt: Everything about boot camp in movies is wrong. At least, it’s wrong today. What you find out in boot camp is that the heart of military life isn’t killing bad guys, fulfilling your potential or being all you can be. It’s uniform inspections. Yes, there are many important things you learn. The shooting is an important part. In some branches, boot camp is the only time you will ever fire a weapon. Learning to march is somewhat important, though you aren’t sure why. The swimming… well that is just awful. If we think about it, we haven’t fought in a non-desert in how long? I’m sure we will someday, perhaps… but the training is not about the skills. The high order tactics used in modern combat are too complex to be pushed down on recruits who barely know how to take the weapon off Safe. In all honesty, most recruits are too stressed, exhausted, and scatterbrained to actually learn anything in depth anyway. A much better environment would be a college or a school house. Later on, they will receive actual training in their military roles. For Marines, this is MOS school, and later on they will attend other specialized trainings in preparation for deployments. This will be where they gain skills. As I said though, boot camp is not about school. It prepares you for military life, the order of things, the customs and courtesies, and what will be expected. It is very intense, but all the skills someone needs to know for an actual war won’t be learned from boot camp. Is it because the recruits will go through Hell together when they get to war? Recruits do not go through Hell together, unless you consider boot camp itself Hell. It isn’t. It’s just training and there is a massive team there to make sure you stay alive, and well. You probably won’t enjoy it like Spring Break in Palm Beach, but it is far from Hell once you get used to it. A major false assumption is that the recruits will stay together for the rest of their military career, that later on they all move on to the infantry together and deploy to war with each other. That isn’t how it works and logically, why would it? The military takes all kinds. We need people who can man the radio, manage the fuel for jets, and shoot the boom sticks. How could these people all stay together when specialized training is required to make each of them specialists in warfare? After boot camp they will leave each other and go to different trainings and then on to their actual military occupational specialty schools, separately. This was mentioned in the last section as what happens after boot camp. Three months to a year after all the recruits leave one another, after all their actual skills training is done, they will join their real unit. These units are all over the world and have many different missions. This is the unit they will be a part of when they go on deployments and who they will go through war with, if they go through war at all. They are just filling a hole from someone else who has left, most likely not from being killed, as the movies would tell you, but from getting moved to a different unit or from being honorably discharged from the service. You will likely see only a few of the guys you went to boot camp with a few more times in your life, by chance, when you run into eachother buying milk at the PX on Mainside. Those who go through boot camp, won’t go through “Hell” together. Is it true that Drill Instructors beat and berate their recruits to make them harder? Drill Instructors/Drill Sergeants don’t physically touch recruits. They don’t hit or physically assault recruits, ever. They come close as the pictures show, but they never physically brutalize potential Marines. There seems to be an odd rule about just getting close enough for the campaign cover to touch. This is drastically foreign to most people’s conceptions, but the Marines use advanced enough training methods to not need to physically or psychologically harm their recruits in the process of making them Marines. They also never take part in racial, ethnic, or sexually derogatory slander. I was recently made aware of a certain Gawker post, where it was said that Drill Instructors call their recruits faggots and other racial slurs “… like 50 times a day.” I’ll say this, the article had many, many inconsistencies leaving me to doubt completely that it was real at all. That said, it exists and now people like me have to say you shouldn’t always believe everything you hear on the internet. I remember that I was actually surprised by the absence of it. It was as if they had all been coached into exactly what they were and were not allowed to do. Instead, there was a sort of “fake swearing” that existed, where everyone used in positions of authority used words like “Freak” rather than certain four letter words you might have expected. It was even odd in some places, “Mother-freaking?” but I almost never heard actual cursing and never anything that sounded like sexual or racial insults. Well, there was this joke about no races existing in the Marine Corps, just dark green and light green Marines. It seemed like a poor attempt at promoting some version of racial equality in the ranks, but it was pretty funny, none the less. If you think about it, there is a real reason why DI’s don’t engage in this sort of thing, beyond just altruism and the tender love that they have for their recruits. A lot of recruits are still pretty much children and their parents are still pretty mothery. They haven’t fully embraced the idea that this place is preparing their children for war, and not just a summer camp. Having said that, many of the Drill Instructors understand that every letter that a recruit writes home could find itself echoed in an email to some Senator somewhere weeks or months later. For that reason, most of the completely unjustifiable aggression has been weeded out of the boot camp process, leaving only the type of aggressive behaviors one might expect as being necessary with the type of mission of the Marines have. This was at least true in 2004 when I attended it and I doubt very much has changed the logic behind it. Continue on to 4 Lessons From the First 5 Minutes of Boot Camp or Read the Full Series. ← Why does boot camp need to be so intense? I believe that there is a happy…ish…medium between what is shown in movies to what is shown in the documentaries. While Full Metal Jacket is an amazing movie and shows the extremes of the training the “old school” generations of Marines may or may not have gone though, I feel that the Ears Open Eyeballs Click documentary of the Marine Corps Boot Camp doesn’t shoe how it truly is. And we’ve all been there. You said yourself that the letters that the recruits write could very well easily find itself echoed to some senator somewhere. It’s also the same way with anyone who is not from that platoon or battalion. As apart of 3rd Bn, Parris Island, 2002, we got slaughtered physically on a routine basis which built us up both mentally and physically. But, we weren’t ever pushed as hard if there were any members not from 3rd Bn who could see us. The last thing we needed was for any civilians seeing us being treated in a way they didn’t feel appropriate and bring their concerns to someone within the higher ranks, or worse, the press. As such, the documentary isn’t nearly as hectic or ‘lively’ as the true experience of surviving and thriving in boot camp. Verbal abuse was definitely kept in check. My drill instructors cursed up a storm when it was just us. And while the cursed the situations or dropped them in front of some descriptive phrasing when telling us about things, they didn’t curse AT us in a derogatory manner…at least…not individually. Sometimes our platoon got it as a whole when we pushed a few too many buttons. Racial slurs weren’t ever used in my platoon from what I can recall. Some of the heavier recruits got called chunky or something similar, but they didn’t harp on it as if that described that recruit as a person. Many of our heavier recruits didn’t leave that way. They were made smarter, faster, and stronger as boot camp seemed to do with every recruit who gets to walk across that parade deck after those 13 “glorious” weeks. Physical abuse wasn’t non-existent, but hidden very well and in such a way that nobody cared. They never outright decked anyone who flapped their gums at the wrong time or throat-checked a recruit who got within their “one-arms distance” bubble. But, if you were on their bad side and you didn’t do things perfectly, they would use slightly excessive force to correct you. They’re grab your elbow too hard and move it to where it needed to be if you weren’t at a perfect 90 degree angle during rifle drill. They would do the same with ‘nudging’ your feet to the right position during rifle week. In general, this is done regardless. But if things were especially heated, their actions came with a little more force thank technically needed when doing so. Like all things, there is the saying, “There is always one.” This is true for boot camp as well. We had an instructor who reached his breaking point with one recruit. He didn’t physically assault him, but he decided to take that single recruit to every pit in the battalion a few times. This essentially broke the recruit mentally as he had a breakdown and was forced out of the platoon. Was this hazing? Definitely. Was the drill instructor punished for it? Of course not. Another drill instructor physically assaulted one of the recruits in another platoon. He was of course removed from his position. These types of cases are very few and far between since Drill Instructors / Drill Sergeants are highly trained professionals and do not lose their bearing or break their discipline easily. Boot camp was a grand time. Oh yeah, we had that one. Lost his rifle during the Crucible. It wasn’t really lost, he just couldn’t find it after a stack arms. He was a pick-up after he apparently was a heat drop. He was messed up and not all there to begin with. I think that our Senior just had enough of it. It was still dark before the final hike started and that guy was like, “Has anybody seen my rifle?” as if he was just lost again. None of us really saw what happened because it was still pitch black. All I know for sure is that Senior got pissed, said some stuff and that dude found himself on the ground. I was right beside it, but like I said, it was dark. That was one of those moments you never forget and no one ever talked about.